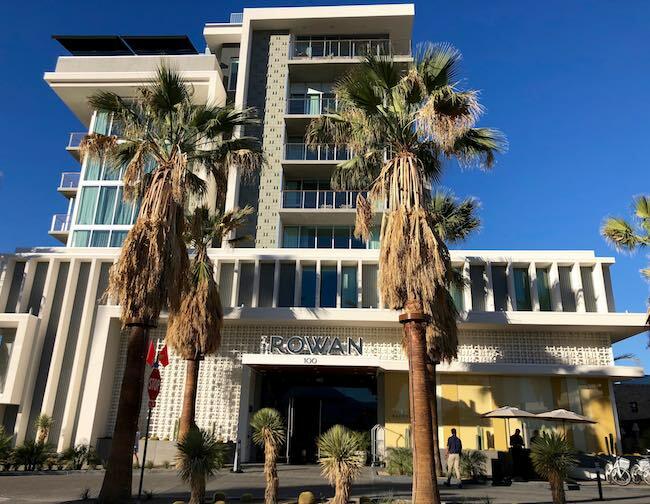 One of nine cities in California’s Coachella Valley, Palm Springs is enjoying a renaissance, and the ultra smart Kimpton Rowan Hotel is its centerpiece, helping to put the city back on the map as the elite destination it once was. “A place out of place and a time out of time,” someone once said of Palm Springs. Alas, in the 70s and 80s, Palm Springs became forgotten as tourism went east to Rancho Mirage and Palm Desert. 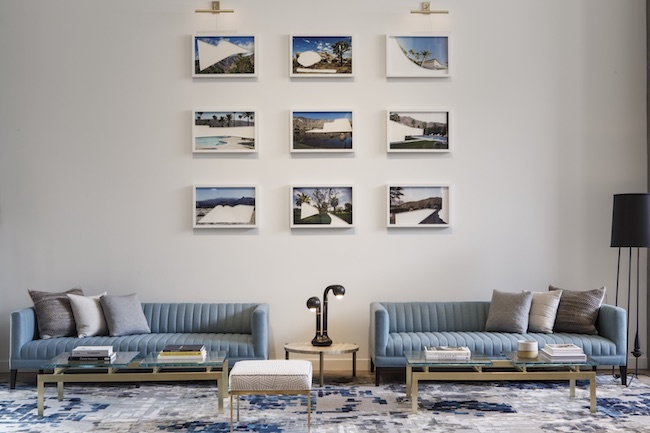 Then in the 90s, a small group began restoring mid-century buildings in Palm Springs; and in 2006, what started as a furniture sale morphed into Modernism Week, Palm Springs’ signature event in February that celebrates mid-century architecture, design, art, fashion and culture. Palm Springs was in the game again. 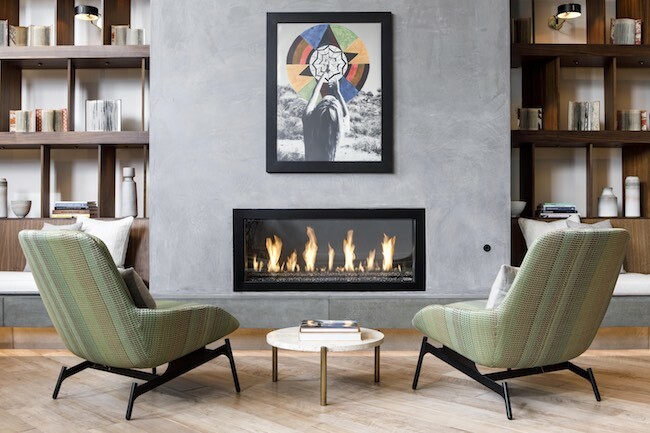 The style of this gorgeous hotel is a nod to the mid-century roots and glamorous history of Palm Springs. Though it has a definite urban vibe with its upscale slick design, it brings the outside in with the mountains and desert landscapes viewed from ample windows and terraces. 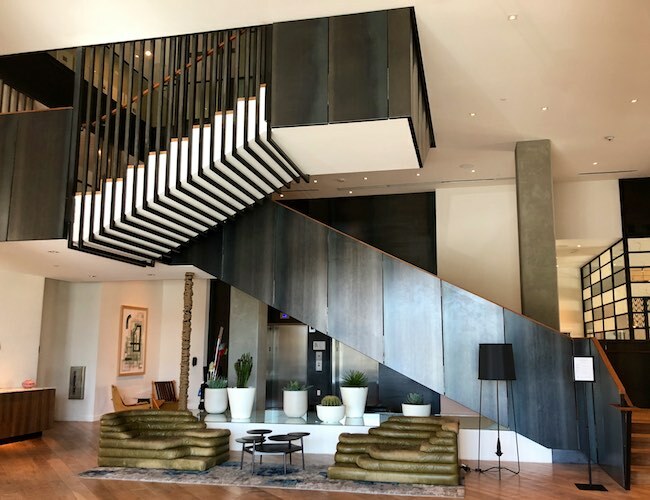 The sleek staircase, furnishings and artwork in the lobby lend a contemporary slant to the mid-century theme. 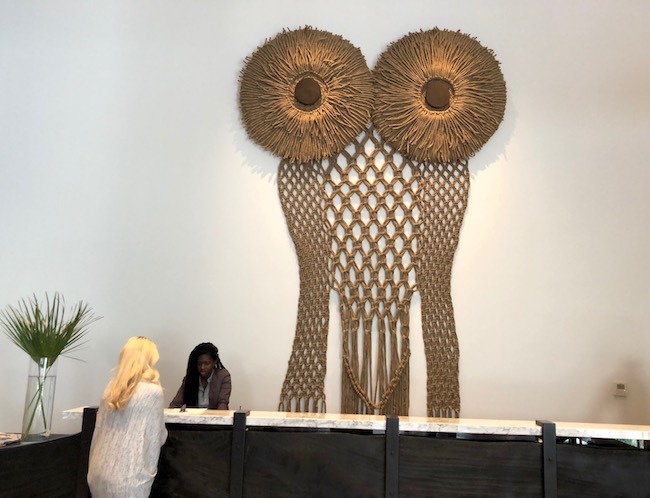 An eye-catching macramé owl behind the front desk recalls the craft of knotting and weaving rope to create artwork that was a craze in the 1970s and no doubt found in every Palm Springs home at that time. I see macramé work all around the hotel. Our king room (out of 153 rooms and suites) is spacious and soothing with its blue tones on grey. 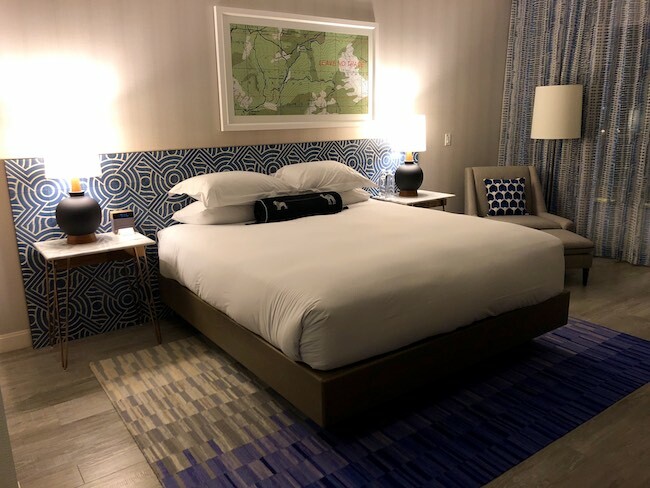 A large topo map of the area over the bed helps us see exactly where we are, and the mountains outside the floor-to-ceiling window give us a strong sense of place. The ceiling is polished concrete, a trend I’m seeing more and more. There’s a lounge chair, long desk with drawers and a TV. The closet is behind a curtain; there we find a safe, a yoga mat (customary with the Kimpton brand) and robe. Also a Kimpton thing: the “closet smile” here is a little camel statue because the city law states it is illegal to walk a camel down Palm Canyon Drive between 4 and 6 p.m.! 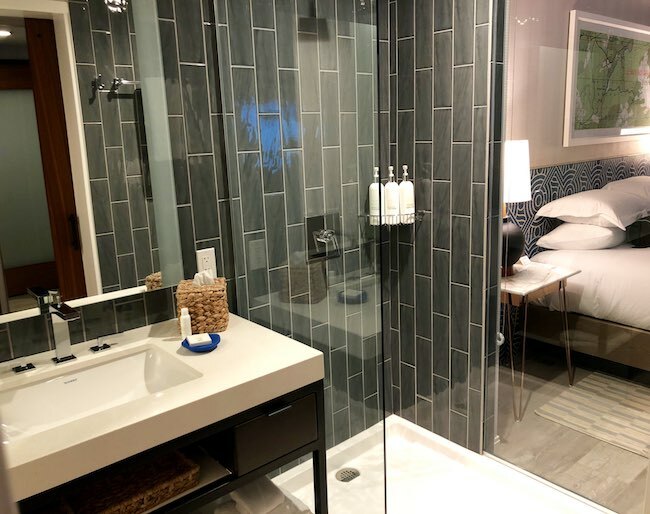 The bathroom is shiny and streamlined, and a full-length window in the shower looks right into the bedroom! If you want privacy, though, there is a pull-down shade. 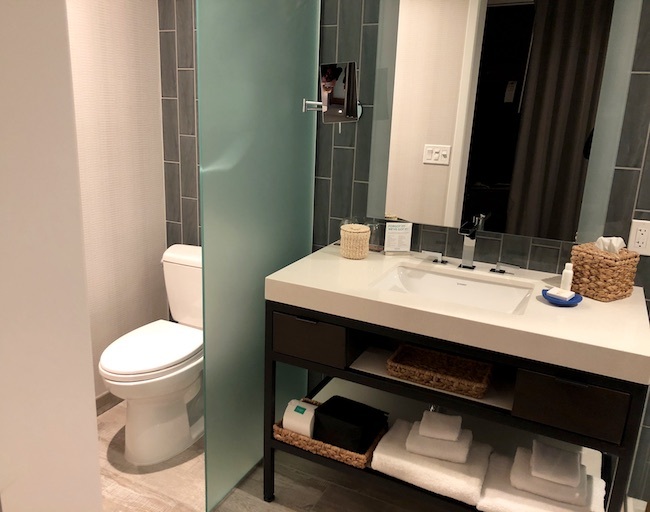 On the other side is the toilet separated by frosted glass. Note the macramé boxes and trays. Also the vanity mirror that I can’t do without! 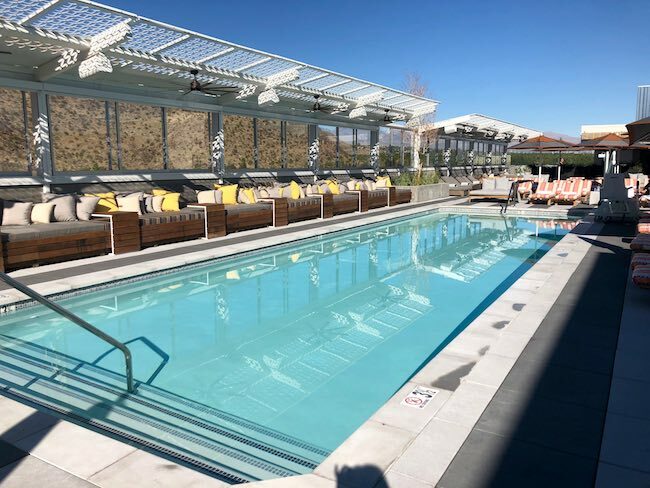 Most noteworthy is the city’s only rooftop pool here atop the seventh story at the Kimpton Rowan, and it’s gorgeous! Sun-splashed by day, a nightlife venue by night, it hosts live music and programs like showings of 50s and 60s movies on high season weekends. 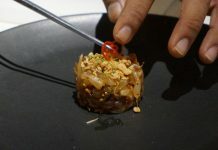 Dinner at 4 Saints on the rooftop is exceptional. It’s one of the sexiest hotel dining rooms at which I’ve ever eaten, and the food is delicious. Imagine Lobster Bolognese Sauce with huge chunks of lobster over Tortellini! The warm Winter Salad is exquisite. Macramé shows up again in the light fixtures. Juniper Table cafe with a lovely patio offers breakfast and an all-day menu until 9 p.m. 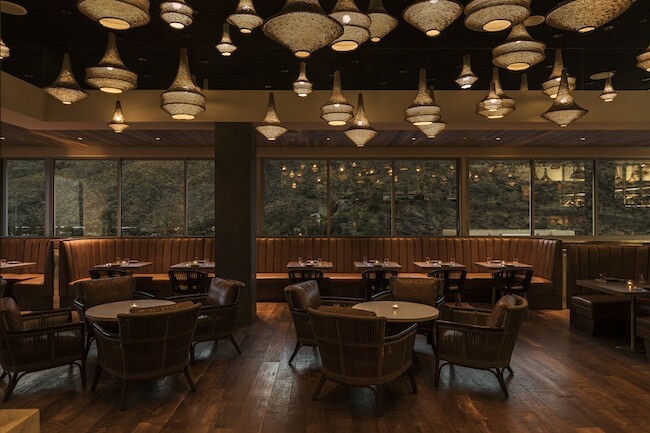 The Window Bar in the lobby and the High Bar on the rooftop feature snacks with artisan cocktails. In addition to indoor/outdoor large and small meeting spaces, there is a fitness center, morning coffee service and evening happy hour in the lobby. 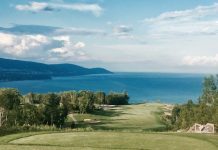 A $35 daily resort fee includes WiFi, valet parking, pool and fitness center access, golf bag storage, laundry and use of bikes. Aerial Tramway Travel from the desert floor to alpine wilderness at 8,516 feet in a tram car that rotates for 360-degree views. At the top there are trails for hiking. Architecture Tours Visit the mid-century modern homes and buildings. 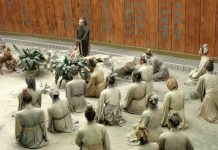 Celebrity Tours Visit the neighborhoods of the Golden Era. Shops on El Paseo This mile-long shopping district in Palm Desert is known as Rodeo Drive of the Desert. Galleries, boutiques, consignment shops, high-end chains, public art and restaurants make up this village-like street that hosts art walks, entertainment and festivals throughout the year. The Living Desert This zoo and desert garden houses animals like cheetahs, giraffes and wolves in natural outdoor habitats of the desert. VillageFest Every Thursday night all year long local artists and crafts people sell their wares along Palm Canyon Drive in a fun, festive atmosphere with food and entertainment.